When my friend Lauren was moving and we were helping them pack, Adam and I ended up taking quite a few things home. One of the things that I got was this awesome frame. I had a couple ideas for what to do with it, but could not find any helpful tutorials on Pinterest or through a Google search, so I used my own ideas and created, what I think, is something awesome! And now there’s a tutorial for you to use. 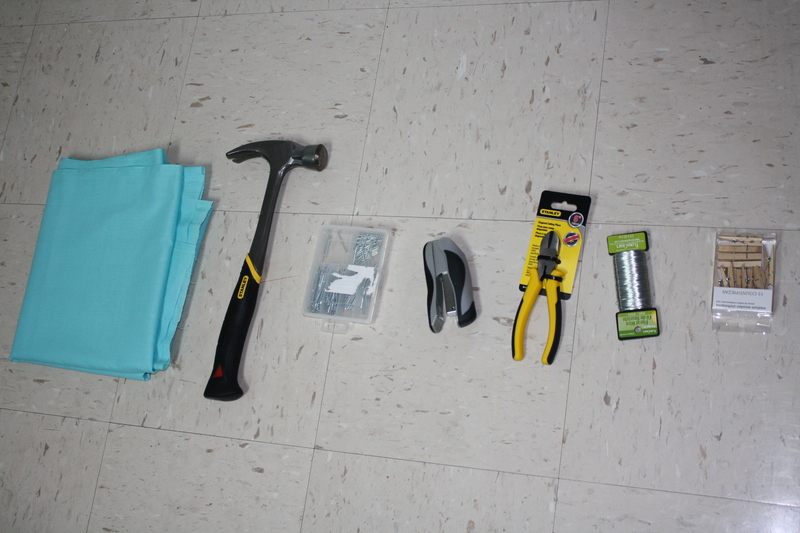 These are all the supplies I used in addition to the frame. 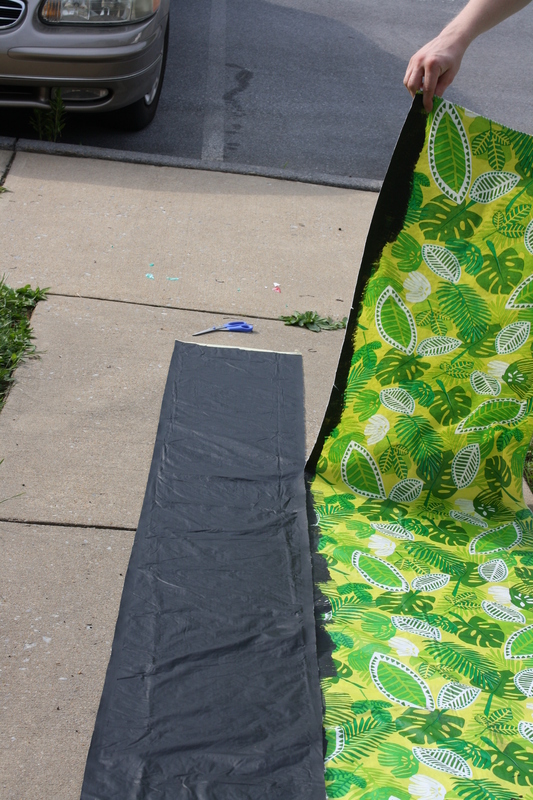 2 yards of fabric, a hammer, some nails, a stapler, wire cutters, wire, and clothes pins. I think of everything I had to buy I spent $10. 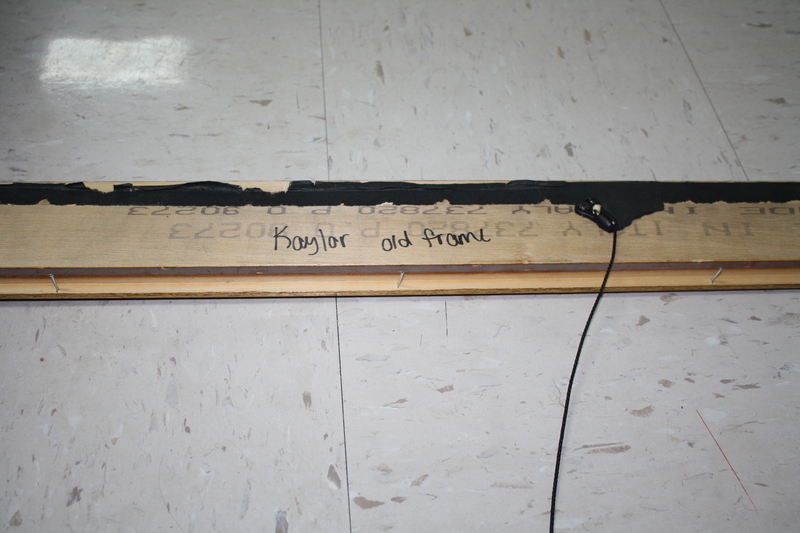 The first thing I did was put three nails on each side of the frame (on the back of the frame) at equal distances. Then, I wrapped the wire around the nail, stretched it across, and wrapped it around the other nail, so it looked something like this. It’s kinda hard to see the wires here, but if you look closely you should see them. 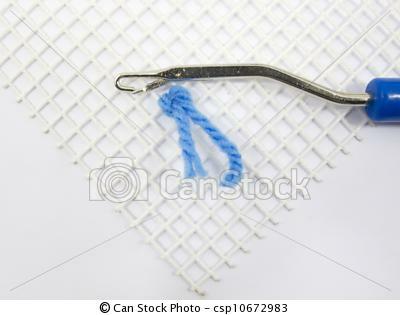 Then, just to be safe and to ensure that the wire didn’t slide off the nail, I hot glued over the top of the nail so there would be no sliding. 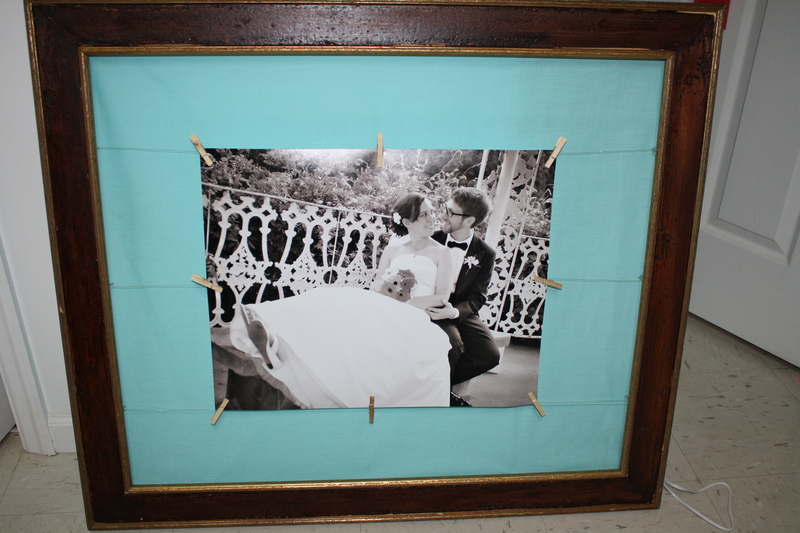 The next thing I did was staple the fabric to the back of the frame. 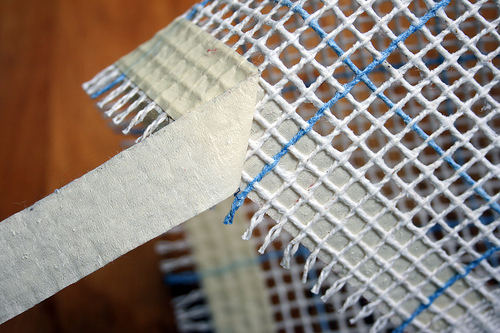 Then, again to be safe, I hot glued on top of the staples to make sure the fabric would not fray around the staples. 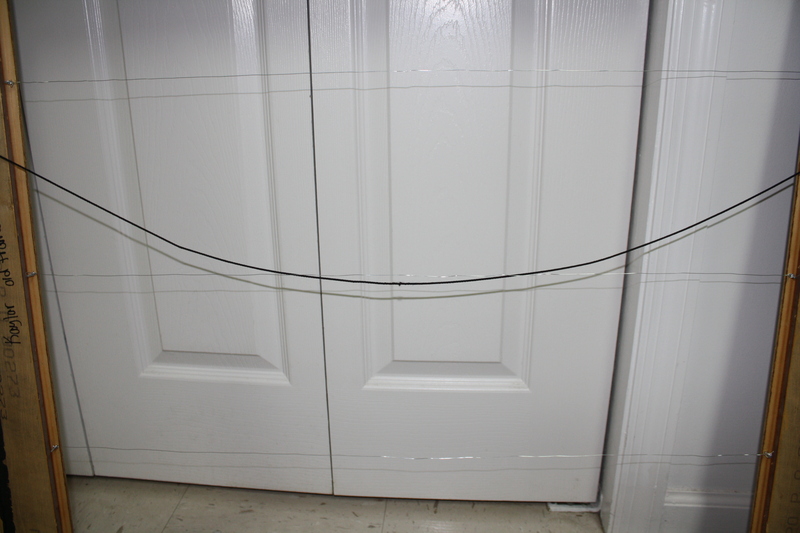 I wanted this to be like a clothesline for pictures. 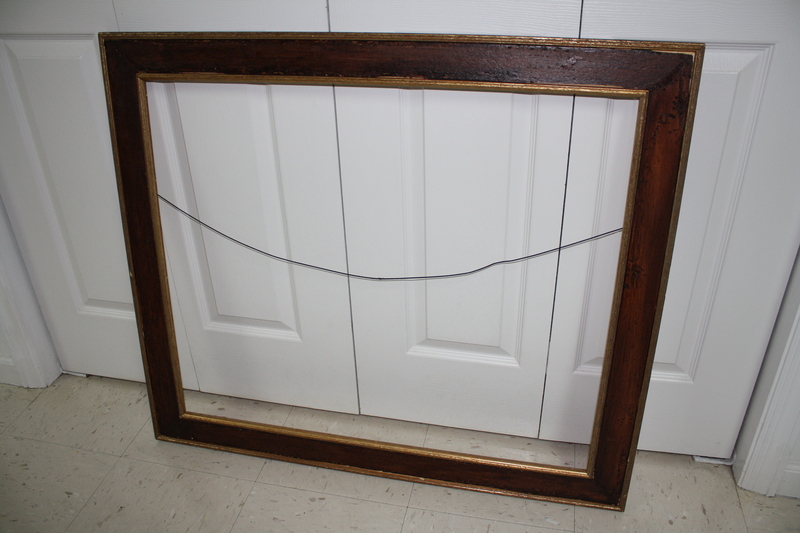 So you can hang a bunch of little pictures using clothespins on each wire, or, I decided to put one big picture up for the time being. Here is the finished product. I did not get a chance to blog yesterday because I was in the car for 12 hours driving back from Illinois. And boy was I worn out! Today, I have an itch to craft! 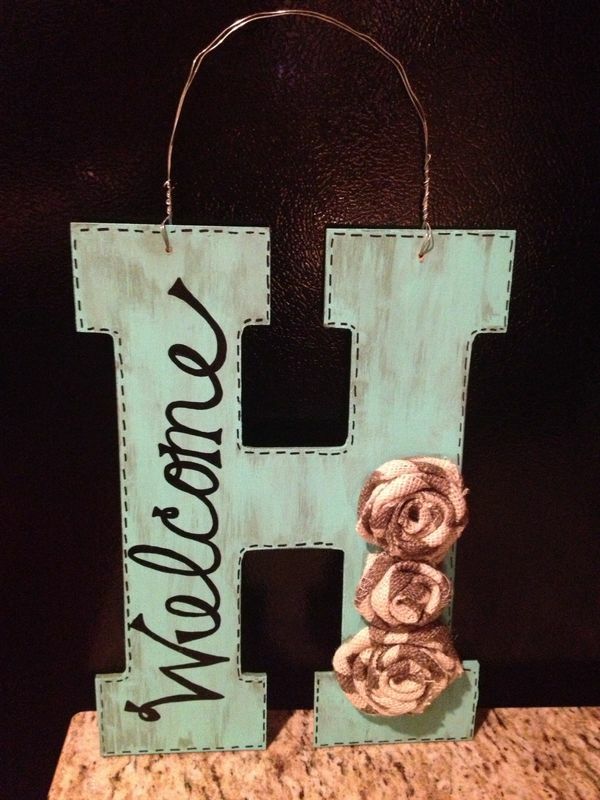 I have been scouring my pinterest boards for the past month looking for a fun craft to do. I have not had much luck. How can it be so hard to find a craft? Well let me tell you. 1-I have next to no wall space left in our apartment. Just about every space is filled with a photo or a canvas or something. 2-I cannot make any more blankets, hats, or scarves, Adam and I both have more than we can use. 4-It needs to be relatively inexpensive. I’m not made of money. After doing some more looking I found a couple ideas that interest me, but some seem expensive, and some just seem like I would be adding clutter to my house. So I would love to hear your ideas. Have you found a great craft that you’d like to share? Because I want to see it! i did the coolest thing ever! i did the coolest thing ever this weekend! want to see? 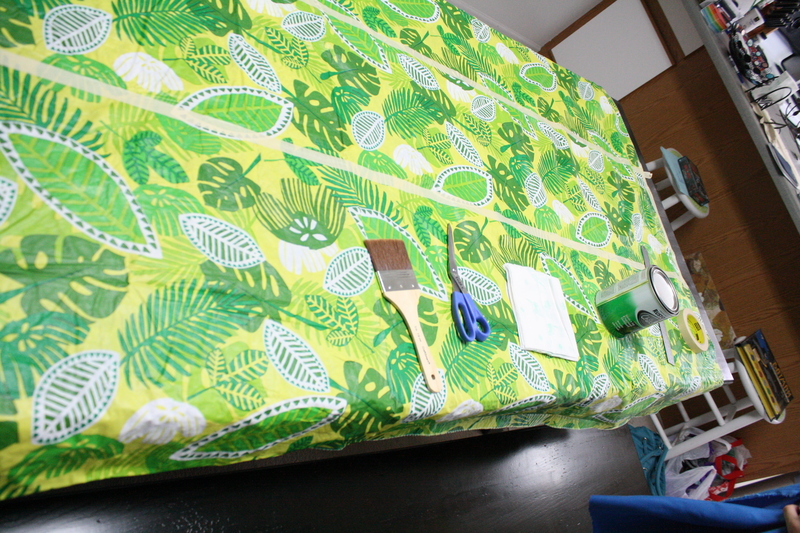 1 vinyl tablecloth, paintbrush, scissors, masking tape, chalboard paint. These things are going to be an awesome table runner! 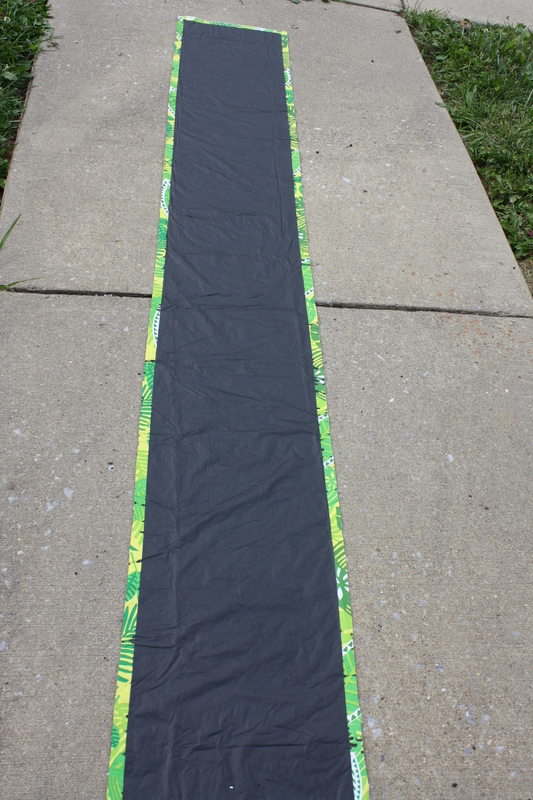 first thing I did was tape out my table runner, which you can see in the above picture. 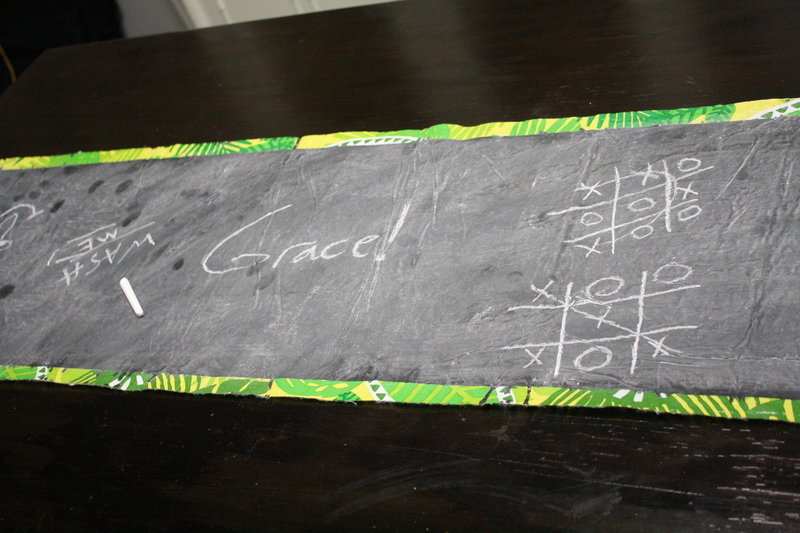 Next, I started painting on the tablecloth with the chalkboard paint. 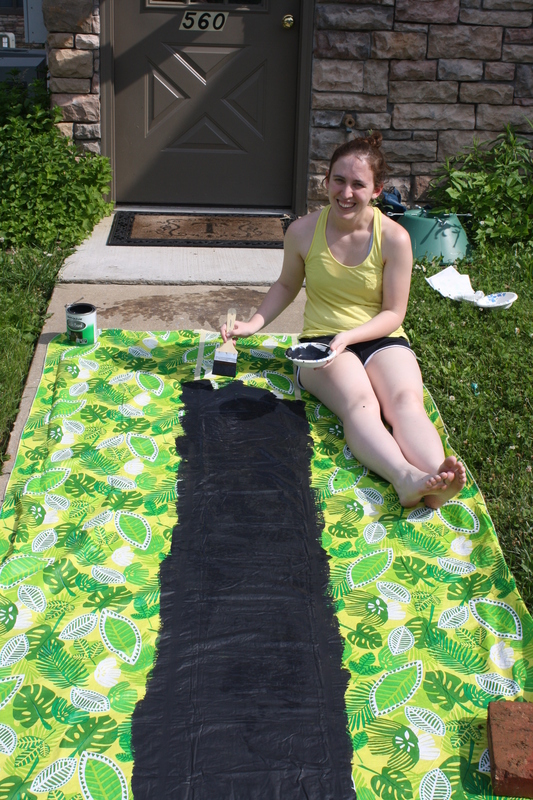 I painted over the masking tape and did three coats. 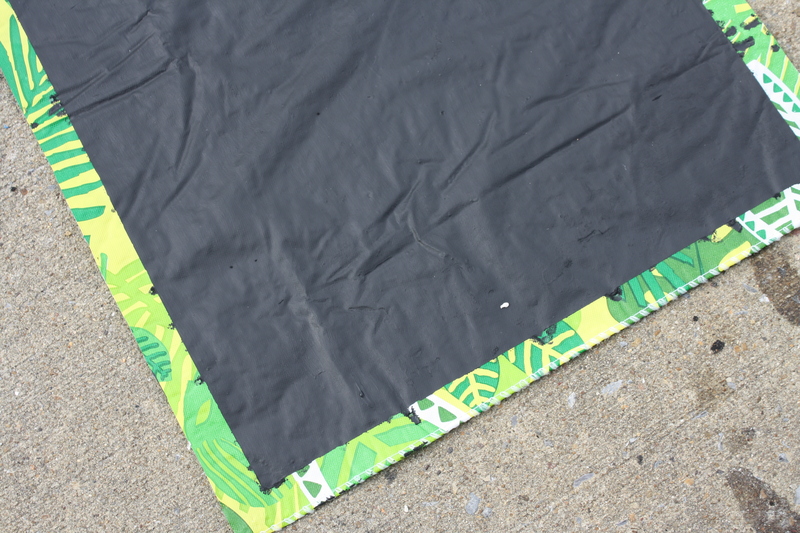 Once it was dry, I cut around the edge of the masking tape. And then I peeled off the tape. 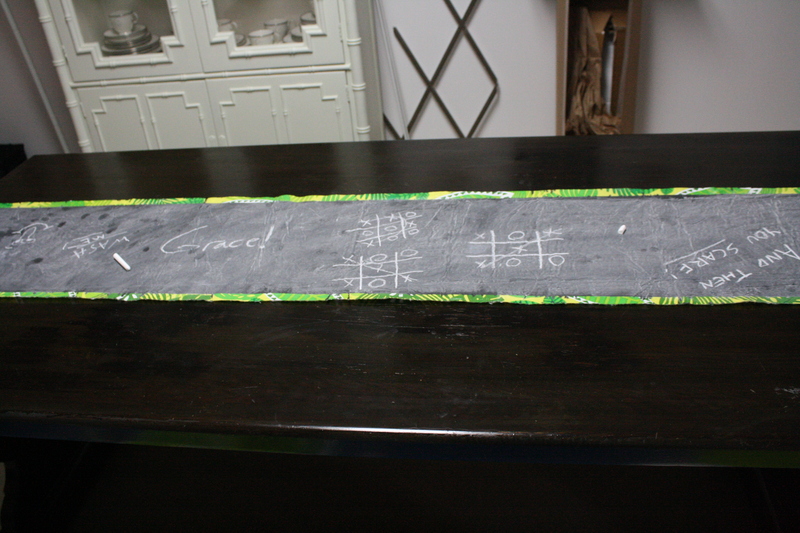 Then, you are supposed to condition the paint by rubbing a piece of chalk over it and then erasing it. 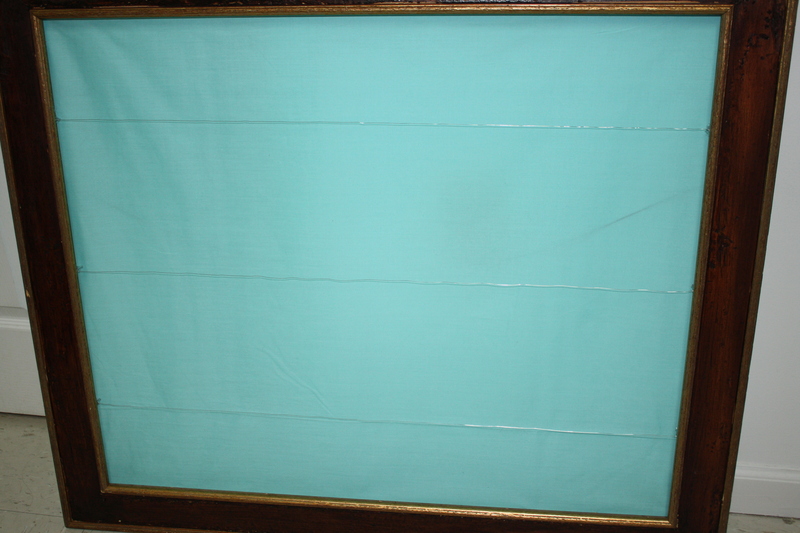 Here is the completed table runner. I am so thrilled with how it turned out! 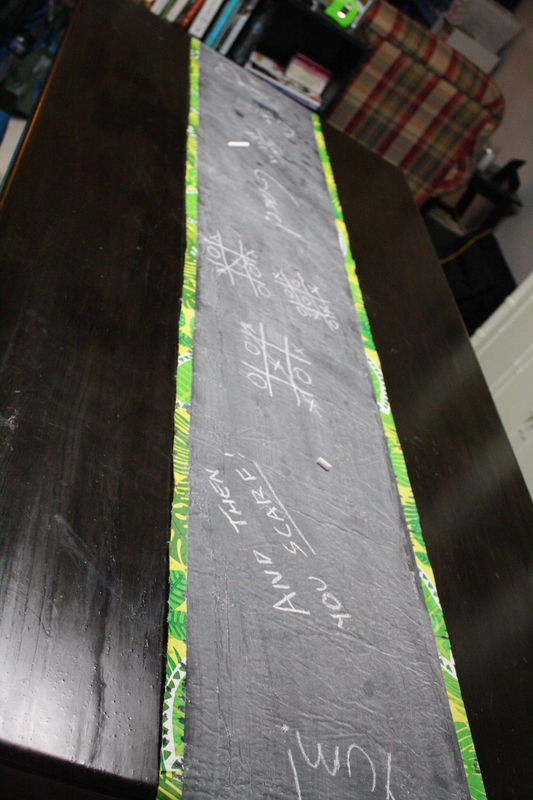 My next great idea: painting the top of my coffee table with chalkboard paint so we can keep score on the table when playing games! Wouldn’t that be awesome! These are some crafts that I am dying to try. I got them off pinterest, but if you click on the photos it will take you to the website where they came from so I can give these wonderfully crafty people the credit they deserve. Since crocheting is a craft that I can do that doesn’t hurt my shoulder I have been searching pinterest for fun crochet things to do. I found this awesome scarf and thought of one of my best friends, so it is on my to-do list to make one for her, and hopefully it turns out as cute as this! Doesn’t this blanket look super wonderful and cozy? I think so! So, after I get the money for the yarn and a bigger crochet hook I am going to tackle this beautiful blanket. I think that this idea is super fun. I don’t really need an end table, so if I made this I do not know where I would put it, but I would have to figure something out because it is just stinkin cute! I love this thing, and I think it would be really easy to make! 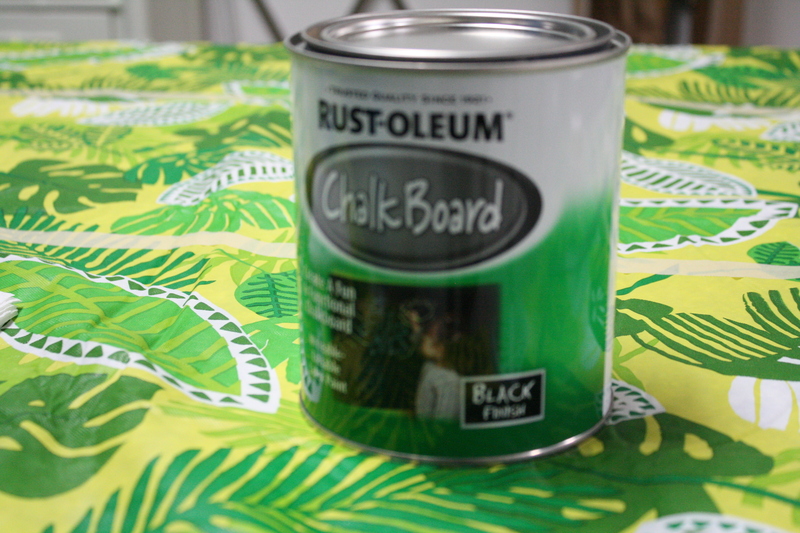 I’m thinking a old cookie sheet, some magnets and scrapbook paper. This one probably won’tget made for a while, but I think it is really cute and would probably help me be more organized. I really love this table runner and have for a while. My parents just gave us a table that looks almost exactly like this and I am dying to try this! I have some of my great-grandmother’s handmade doilies, and since my doilie skills still need some work, I jsut need more of them to finish this. Anyone know where I can get some doilies? What’s on your craft to-do list? The only current craft I have going right now I have been working on for almost a year now, and I’m sad to say that this one might be the first one that I don’t finish. The whole time I have been working this has been my goal. Look how nice and fluffy and soft it looks. And then I read the tutorial and I thought “oh that’s easy.” WRONG! It’s so hard! 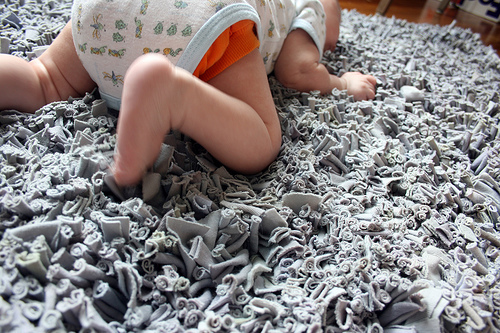 First, you have to have enough t-shirt strips to cover the entire rug. Each strip is about 1-inch wide and 4-inches long. Let me tell you right now, that’s a lot of cutting. I have so far cut up about 15 Hanes white T’s and I’m not even close to having enough! That’s probably because when I go for something, I go wayyyy too far. When I first started and bought my latch hook canvas I bought way too much. When I opened the package I had double the amount that I actually needed. So once I cut that in half I had a canvas of about 20 squares by 20 squares. So you see that blue line making a square with a bunch of little squares in it? So twenty of the blue squares by 20 of the blue squares. So that’s a total of 400 big squares and each big square has 100 little squares. The tutorial said to put a strip on every other little square. On my canvas, being how huge it is, that’s 20,000 strips of t-shirt!! But did I try and figure this out before I started? No. I figured this out after finishing about 10 blue squares. 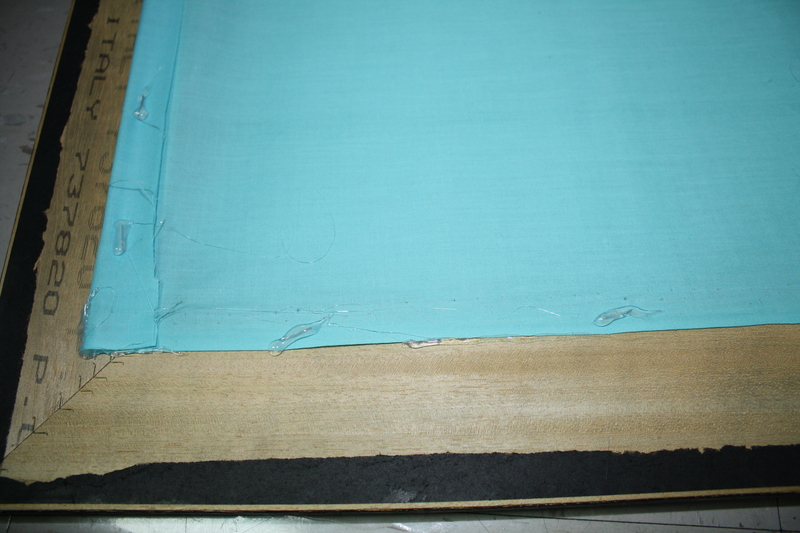 And that is when I cut it in half, so now I’m only dealing with 200 blue squares and 10,000 strips of t-shirt. Honestly, by the end of this, I’ll be lucky if I have the energy to make a bath mat sized rug. Now, the process itself is not that easy, it’s not just the size of the project, it’s the actual process and the time that it takes to do it. 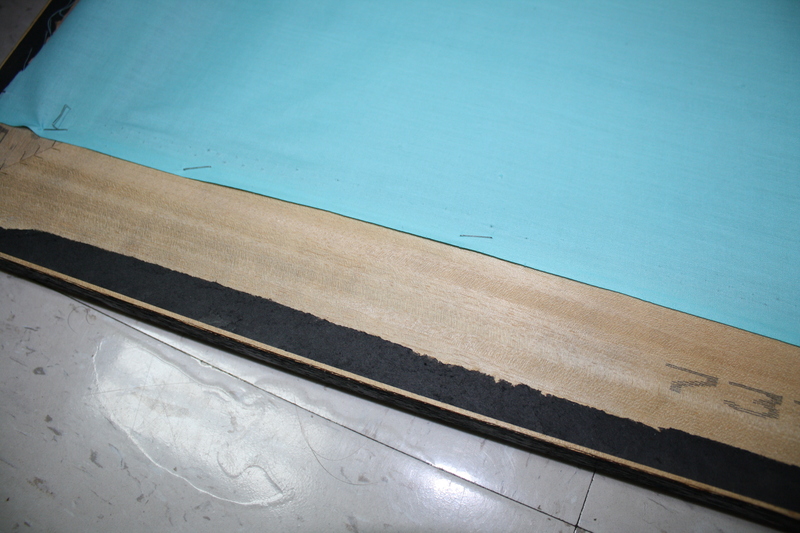 1-do you know how long it has taken me to cut the 4,500 strips of t-shirt that I have? Probably about 20 tv shows. After cutting that many t-shirts and only being halfway toward my goal I decided to start making the rug with the strips I had. Easier said than done. You’re basically just making a knot. So, needless to say, I have like 8-10 blue squares done out of 200. I need some motivation or this is never getting done. As we speak, the whole project is in a bag hidden in my office because I’m too annoyed to even look at it. 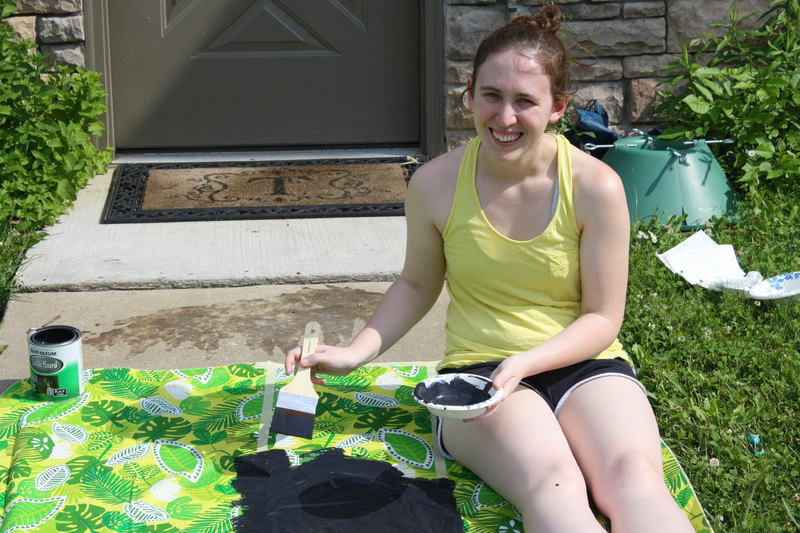 Did you ever have a project that you thought would never get done? Anyone want to have a latch hook party to help me finish? *Coming Soon–I will be trying out a new recipe from The Pioneer Woman (she’s my favorite), so be looking for a blog about it soon after!